Navigating Theory on Demand is a new way of reading, interacting and working with an e-publication. In collaboration with the PublishingLab a new reading platform has been developed for the Theory on Demand series to make the publications easily readable and browsable online. That means that INC publications will evolve once more: next to PDF, epub and of course paper, we are now working towards a smartphone and tablet friendly reading experience based on HTML. Thus, Navigating TOD aims to find a new way of interacting with the publications and their content, by breaking away from the limitations of print and ebook. 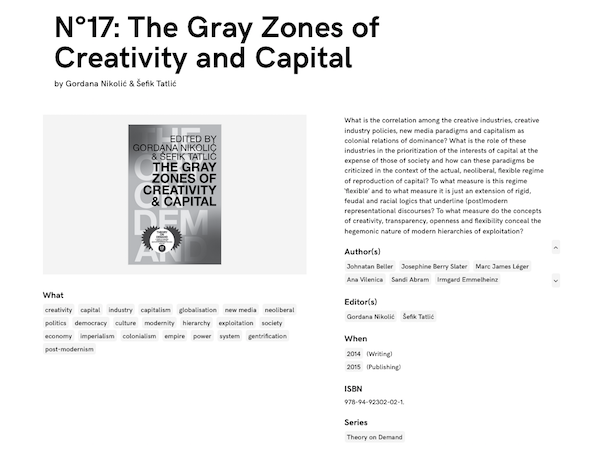 Please note that the platform is developed with The Gray Zones of Creativity and Capital, Theory on Demand #17, as focus point. This is the only publication that is available in the beta version as of now.